If you build models of any type, trains, planes, cars or miniatures, paint storage is normally a sticking point. The main issue is the amount of space they take up and how to easily find the color you want. 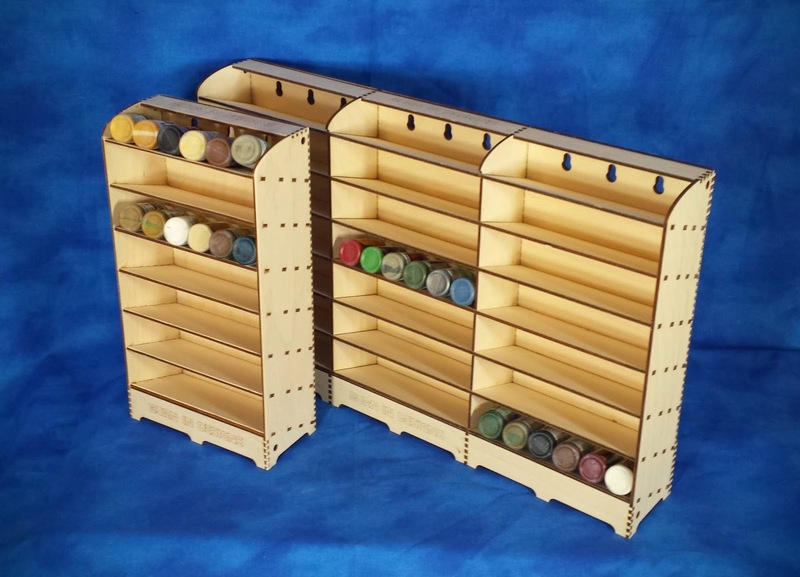 We are now releasing 3 different Vertical Paint Storage Units to help solve those issues. The new units allow for high density storage of paint pots in the minimum amount of space. All units are available in wood or acrylic in the following colors standard, clear, grey/bronze or white. They can also be custom ordered in black, blue, green, yellow and red for a small additional charge. Custom engraving is available on all units at no extra charge. First up is the VStore-5. 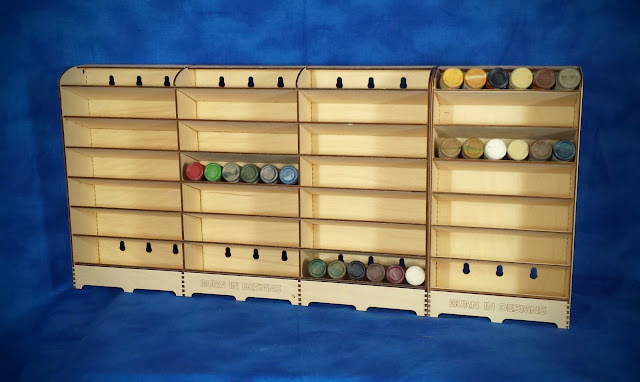 This is a medium density unit with a horizontal top shelf and 5 deep, angled shelves to support taller paints. By angling the paints we are able to increase the shelf count and still securely hold some of the taller dropper bottle paints. The angle helps 2 keep the bottles in place and still provide a good view of the paint colors. Next we have the VStore-6 & VStore-8HD. These are high density solutions. 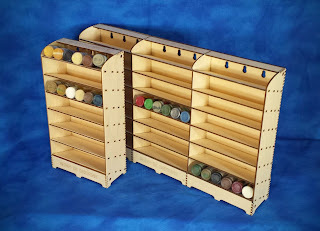 Like the VStore1 it has the top tall storage shelf but the shelves have a shallower angle, around 5 degrees, designed to help hold the paints in even if wall mounted. The unit is shown in the Vstore-6 version with 6 shelves spaced about a 1.5" apart. This size will support the older GW paints and inks. If you are using the smaller dropper style bottles the VStore-8 rack is available with 8 shelves for even higher density. The Expandable Paint Dropper Bottle Wall Storage System was designed to address this problem directly. 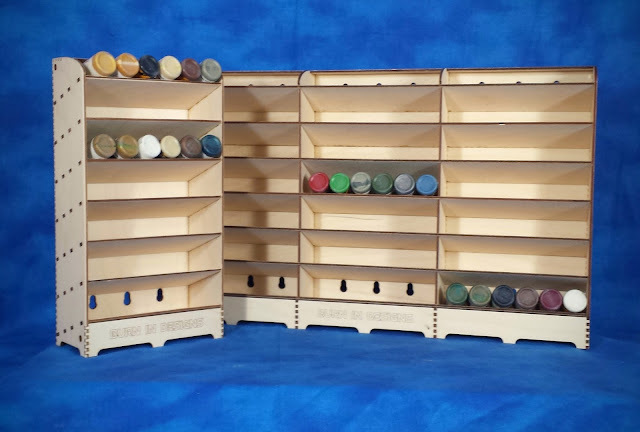 Each section contains 7 shelves each able to hold 6 standard dropper bottles, 42 paints in total. Paints can be stored either direction for faster identification. The bottles are also fully supported and so there are less chances for them to fall out as paints are removed and replaced. Each unit is pre-drilled to attach multiple sections together to create seamless storage walls. The units include wall mounting keyholes and reinforcing strips to ensure a solid, sag free attachment to walls. The system is available in 2 sizes a single 42 bottle or a triple 126 bottle unit.